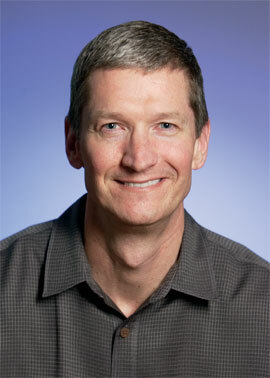 Apple COO Tim Cook Dismisses Android Tablets As "Bizarre"
Apple’s iPad is a hit. The company sold 7.3 million iPads in the December quarter of 2010, a 75 percent increase from the previous quarter. But judging from all the Android tablets announced at CES, it is about to face an onslaught of competition. So far, though, Apple COO Tim Cook has “no concerns” with the tablets that are out there today, and goes so far to call current Android tablets “bizarre.” On today’s Apple earnings call, Cook characterized the competition as falling into two buckets: Windows-based tablets, which are “big, heavy and expensive” and suffer from “weak battery life,” and current Android tablets, which are “scaled-up” smart phones. Q: What about iPad competitors? TC: There’s not much out there as you know. There are two kinds of groups today (in the market) — the ones using a Windows-based operating system. They’re big, heavy and expensive. Weak battery life. Need keyboard or stylus. From our point of view, customers aren’t interested in that. Then you have the Android tablets. The variety shipping today, the OS wasn’t designed for a tablet — but Google said this. So you wind up having the size of a tablet that’s less than reasonable. Or one that’s not even a real tablet experience. It’s a “scaled-up smartphone” – that’s a bizarre product in our view. Those are what is shipping today. If you do a side-by-side with an iPad, some enormous percentage are going to pick the iPad. We have no concern there. In terms of next generation. There’s nothing shipping yet. So I don’t know. “Today they’re vapor.” However, we’re not sitting still. We have a huge first-mover advantage. And a huge user advantage from iTunes to the App Store. Huge number of apps and an ecosystem. We’re very confident entering into a fight with anyone. He thinks Apple is just scratching the surface in terms of fulfilling demand for tablet computing. He notes that there is interest across the gamut from consumers to enterprises.